The last card from Club-last weekend :) This is very similar to one I did previously (in Pacific Point for the SUDSOL Blog tour), using the Flower Garden embossing folder. The color on this one is Tangerine Tango. Card base is Tangerine Tango. 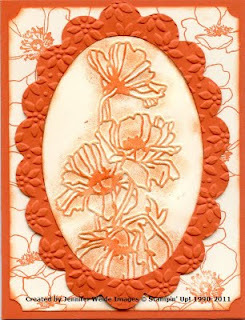 Background is Very Vanilla that we stamped randomly the two outline flowers from Fabulous Florets. We punched the corner with the Ticket Corner punch and sponged the edges. the center image is cut with the Frame. Oval Scallop die in the Big Shot. The "frame" is Tangerine Tango, the "center" is Very Vanilla. 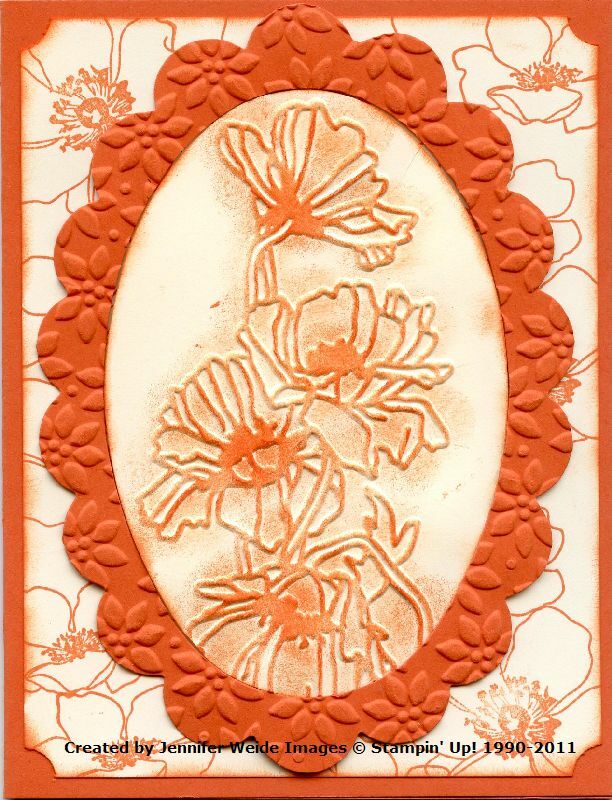 We embossed the center oval with the Flower Garden embossing folder and then sponged on Tangerine Tango ink with a sponge dauber. GORGEOUS!!! LOVE IT! AND WHO WOULD HAVE THOUGHT TANGERINE COULD BE SO PRETTY??! !